You'll Love Our Friendly Service at Woodland, CA Hotel's LocaleWelcome to our newly renovated Holiday Inn Express Woodland. Situated near Sacramento International Airport, our hotel's location is ideal for business and leisure travelers alike. 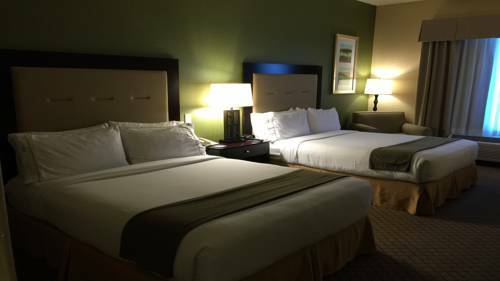 Just off Highway 5 and next to E Main St, the Holiday Inn Express Woodland hotel offers easy access to local attractions and businesses, as well as those in Davis and Sacramento. Also, with a 24-hour notice, our free shuttle can take you to and from the Sacramento airport (SMF) from 4am-11:30pm. Our hotel's corporate benefits are superb, and major businesses like the Target Distribution Center, Rite Aid Center, True Value Warehouse and Halliburton are all located near us. Additionally, our hotel's 800 sq-ft fully equipped meeting room can accommodate up to 40 people, and our 24-hour business center is available at all times.Looking for something to do? The City of Trees hosts the Yolo County Fair, Sacramento Valley Scottish Games and various dog shows. Just a few feet from our hotel is the Hay's Antique Truck Museum, or you can visit the Woodland Opera House and Yolo County Historical Museum in the downtown area.We strive to make your stay here special. With perks like an indoor heated pool, whirlpool, fitness center, free Wi-Fi access, complimentary hot breakfast bar and free parking, it's easy to see why we're among the best friendly hotels in the Sacramento area. Heidrich Agricultural MuseumAntique Tractor and Truck Museum.